Grand Ole Opry star Mel McDaniel passed away Thursday evening at age 68. He had been battling cancer for several years. The Oklahoma native has been an Opry cast member since Jan. 11, 1986. McDaniel is noted for such hits as “Gentle to Your Senses” (1977), “God Made Love” (1978), “Right in the Palm of Your Hand” (1981), “Take Me To the Country” (1982) and “I Call it Love” (1983). He was best known for his rollicking, rousing, uptempo signature songs “Louisiana Saturday Night” (1981), “Preaching Up a Storm” (1981), “Big Ole Brew” (1982), “Baby’s Got Her Blue Jeans On” (1984), “Let it Roll” (1985), “Stand Up” (1985), “Real Good Feel Good Song” (1988) and his cover of Bruce Springsteen’s “Stand on It” (1986). His No. 1 hit “Baby’s Got Her Blue Jeans On” was nominated for both a Grammy and a CMA Award. McDaniel was also notable as a songwriter. In addition to co-writing his hit “God Made Love,” he cowrote Conway Twitty’s 1978 hit “The Grandest Lady of Them All.” Bobby Goldsboro’s 1981 hit “Goodbye Marie” was a McDaniel song, and it was revived on the charts by Kenny Rogers in 1986. Hoyt Axton sang McDaniel’s “Roll Your Own,” and his songs were also recorded by Doug Kershaw, Livewire and other artists. 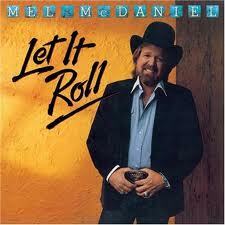 Mel McDaniel was born Sept, 6, 1942 in Checotah, OK. The town later gained further notoriety as the girlhood home of current superstar Carrie Underwood. After apprenticing in the honky-tonks of Tulsa, McDaniel served a two-year stint in the nightclubs of Anchorage, Alaska before moving to Music City in 1974. He sang at local Holiday Inn lounges and recorded song demos on Music Row before signing with Capitol Records in 1976. He remained with the label until 1990. His most recent album was 2006’s Reloaded: Tried True and New, released by Aspirion Records.